Later This Week, Candidates And PACs Involved In The Race Will Have To File New Disclosures Of Where Their Money Is Coming From. LANSING (OCT. 22, 2018) — By the end of the week, we’ll know a lot more about the donors and groups seeking to influence Michigan’s 2018 race for governor. On Thursday, political action committees (PACs) and super PACs involved in the state races will have to file reports on their fundraising and spending. Their reports will cover from July 21 through Oct. 20. Then, on Friday, the candidates themselves will have to file their own reports, covering from Aug. 28 through Oct. 21. Even before those filings, the 2018 race for governor has already attracted about $61.6 million, according to an analysis by the Michigan Campaign Finance Network. The following is a look at how we arrived at that number and where some of the money has come from. The general election candidates combined to raise $14.8 million as of Aug. 27. — Former Senate Minority Leader Gretchen Whitmer, a Democrat from East Lansing, raised $8.2 million. Her top donors include the Michigan State Utility Workers PAC ($68,000), the Michigan Laborers Political League ($68,000), the Bernstein PAC, ($68,000), the Michigan Infrastructure and Transportation Association ($68,000), the Michigan Regional Council of Carpenters ($68,0000 and the United Auto Workers Voluntary PAC ($68,000). The maximum a PAC can give a statewide candidate in Michigan is $68,000. — Attorney General Bill Schuette, a Republican from Midland, raised $6.5 million. His top donors include the Michigan Republican Party ($100,000), the Realtors PAC ($68,000), the Michigan Chamber PAC ($61,850), the Michigan Beer & Wine Wholesalers Association ($52,750) and the Miller Canfield PAC ($52,000). — Bill Gelineau, a Libertarian from Grand Rapids, raised $54,785. He has self-funded much of his campaign, giving $36,005. For the general election, we’ve tracked $16.3 million in outside spending. 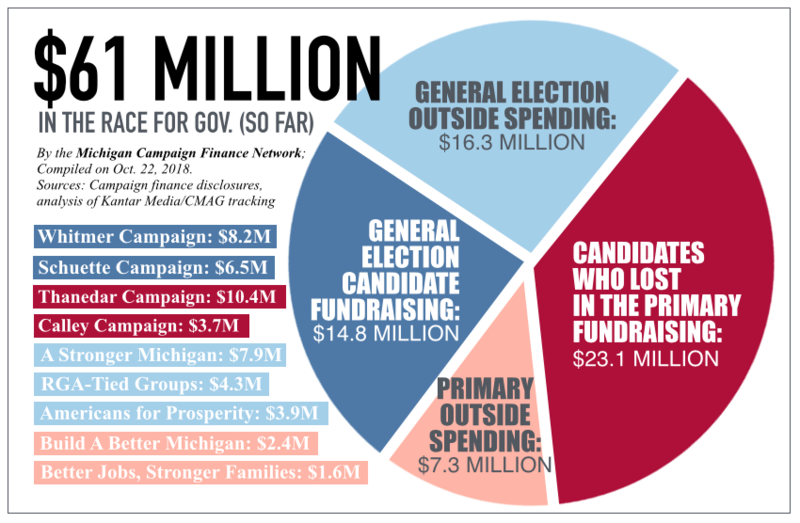 — The biggest individual spender so far in the general election has been A Stronger Michigan, a 527 connected to the Democratic Governors Association. It’s been running positive ads about Whitmer and negative ads about Schuette. But the ads don’t expressly tell viewers how to vote so they don’t fall under Michigan’s campaign finance regulations and the group doesn’t have to report its fundraising and spending to the state. Because the group is a 527 political organization, it had to report its spending — $7.9 million as of Sept. 30 — to the IRS. Its top donors include the following: another 527, Progressive Advocacy Trust, ($1.5 million); the Democratic Governors Association ($1.5 million); American Federation of State, County and Municipal Employees Special Account ($750,000); Michigan Corrections Organization ($750,000); and another 527, Build A Better Michigan, ($525,000). — Americans for Prosperity, a national conservative nonprofit organization, has reported spending $3.9 million in opposition to Whitmer. The group, which has previously received funding from the powerful Koch family, doesn’t have to disclose where its money comes from but has been reporting its spending to the Secretary of State through independent-expenditure filings. — Two groups connected to the Republican Governors Association have also aired an estimated $4.3 million in ads that either promote Schuette or criticize Whitmer. MCFN arrived at the number by analyzing ad-tracking data from Kantar Media/CMAG. RGA Michigan 2018, which was previously called A Stronger Michigan, has aired about $2.8 million in broadcast ads. The group appears to be a PAC and is expected to file a report on its activities on Thursday. An RGA-connected nonprofit called State Solutions has aired about $1.4 million in ads. The nonprofit doesn’t have to disclose where its money comes from. — The Michigan Sierra Club Independent Action PAC, an environmental organization, has also reported spending $124,231 in support of Whitmer. — Driving up the fundraising numbers is Democrat Shri Thanedar, of Ann Arbor, whose campaign reported raising about $12.7 million. Of that, about $12.6 came from Thanedar himself. 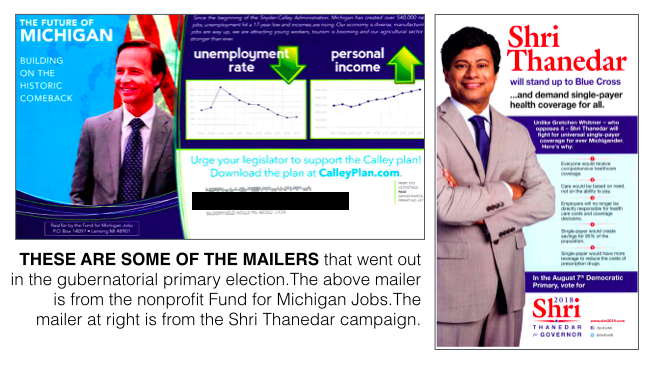 Thanedar paid himself back $2.3 million of the money he gave his campaign. The campaign raised a net total of about $10.4 million. — The other Democrat in the primary race was Abdul El-Sayed, of Shelby Township. His campaign raised $5.4 million. 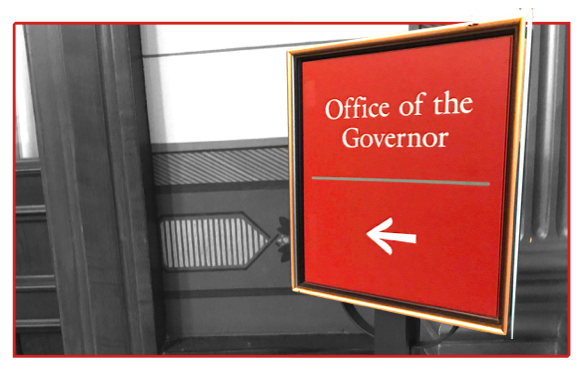 — On the Republican side, Lt. Gov. Brian Calley’s campaign raised $3.7 million. Two PACs, MI PAC and Value for Michigan, made maximm contributions of $68,000. MI PAC is a PAC connected to Calley. The treasurer of Value for Michigan is GOP political consultant John Yob. — Dr. Jim Hines, a Republican from Saginaw, and his wife, Martha, chipped in $2.7 million for the Hines campaign. The campaign raised $2.9 million overall. — State Sen. Patrick Colbeck, a Republican from Canton, raised $538,787 for his campaign, and Libertarian candidate John Tatar raised $11,578. Tracked outside spending in the primary election amounted to about $7.3 million. — Better Jobs, Stronger Families, a super PAC supporting Schuette, had reported spending $1.6 million as of July 20. Its top donors include the nonprofit Fund for Michigan’s Tomorrow’s ($300,000), the nonprofit Better Jobs Stronger Families Policy Solutions ($275,000) and Mohammad Qazi of Ciena Healthcare, ($250,000). — Calley Continues Comeback, a super PAC supporting Calley, has reported spending $861,867. Its top donors include William Parfet of the Northwood Group ($323,540) and T.E. Adderley of Kelly Services ($250,000).